Control Point Associates, Inc. partnered with developer Eric Blumenfled to revitalize the interior space of the historically known Philadelphia Metropolitan Opera House built by architect, William H. McElfatrick in 1907. After closing its doors in 1988, Reverend Mark Hatcher, Jr. and the Holy Ghost Headquarters purchased the building in 1995 in hopes to revitalize the building. 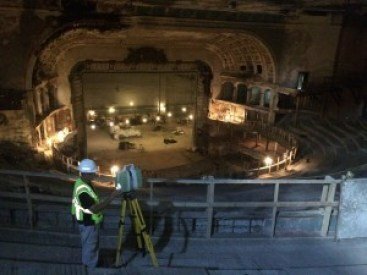 Control Point Associates, Inc. was contracted to provide floor plans for site preparation of the extraordinary 39,200 square foot theatre. “Due to the theater’s size, tiered levels and the requested level of detail, Control Point decided the best resource to reach the clients goals as effectively and efficiently as possible was to utilize 3D Laser Scanning technology,” Greg Sawulski said, Project Manager at Control Point Associates, Inc.
“In order to make the necessary renovations, the client requested highly detailed scan data in which Control Point was able to provide them with in a virtual environment called a TruView,” Sawulski stated. The TruView virtual environment is a panoramic, photo realistic environment that requires no plugin and can be accessed anywhere in the world. This technology provides the ability to virtually access the site at anytime from anywhere in order to view, pan, zoom, measure and mark up the project. These virtual benefits dramatically increases the productivity and workflow requirements of any project. Control Point Associates, Inc. looks forward to more opportunities in fostering relationships with historic societies in order to provide the necessary tools to successfully complete revitalization projects. For more information about Control Point Associates, Inc. please visit: www.cpasurvey.com or contact Ken Stigner, kstigner@cpasurvey.com to speak with a professional about your project goals.